After an emphatic 19-point win over Clontarf on Sunday, Dublin University Football Club (DUFC) Women travelled out to Belfield yesterday to take on rivals University College Dublin (UCD) in Colours with a serious wind in their sails. 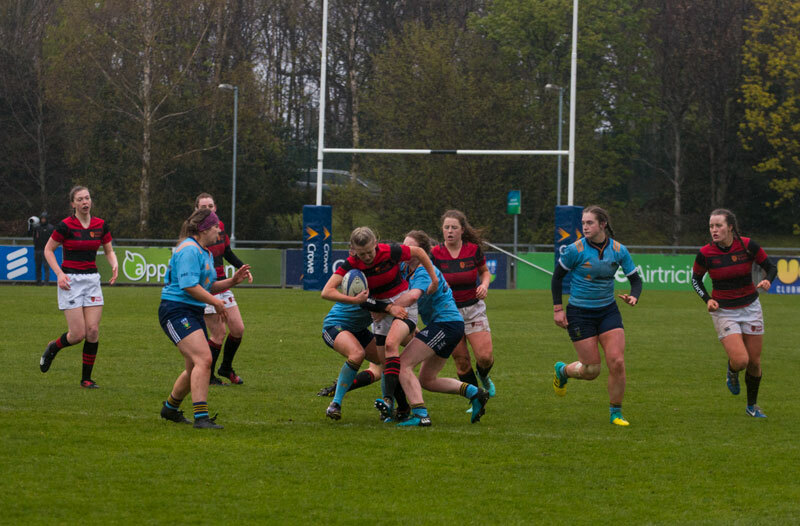 Trinity, however, were unable to make a comeback after a strong first half from the hosts, the women in blue emerging with a 15-7 win to claim the bragging rights for the fourth year in a row. Trinity started brightly, some tough tackling forcing a knock on from UCD early on. Handling errors would plague both teams for most of the game, as the rain shifted from a light drizzle to a total downpour in the last 20 minutes. Some hard running from Niamh O’Kelly Lynch and Ellen McGee on the wing strained the UCD defence. It was the home side, however, who drew first blood, Alice O’Dowd smashing her way through the Trinity defence off the back of a scrum and over the line. Christine Coffey was unable to convert and after 18 minutes UCD were up by five. Trinity ramped up the pressure after this setback. A break from captain Jane Leahy brought Trinity into the UCD half and a well-placed kick from Honor MacNamara found touch inside the 22. UCD struggled to keep their lineouts straight throughout and Trinity managed to win the ball back. The away side were unable to capitalize on their territorial advantage and UCD forced a knock on. With a few minutes left in the half UCD went up 8-0. A testing kick caught O’Kelly Lynch unawares and she was left scrambling to regain possession inside the Trinity 22. UCD forced a penalty from there and Coffey pointed to the posts. Her kicking, for the most part, was impeccable throughout and she landed the kick with minimal fuss. DUFC nearly clawed back a try with a couple of minutes to go. MacNamara, in fantastic form, booted a challenging ball to UCD full-back Aoife O’Shaughnessy. Under pressure from the oncoming Trinity pack, she booted it horizontally across the pitch, the ball just about making touch rather than landing in the hands of the oncoming Trinity backs. Again, however, Trinity were unable to take advantage of their attacking platform, giving away a scrum off the lineout. UCD secured possession and punted the ball out for half-time. DUFC played all of the rugby for most of the second half. Just before the hour, O’Kelly Lynch caught a UCD clearance and sprinted full pelt at the UCD defence, breaking a number of tackles and bringing the away side into the UCD 22. From there they showed remarkable patience, slowly battering their way closer and closer to the line. 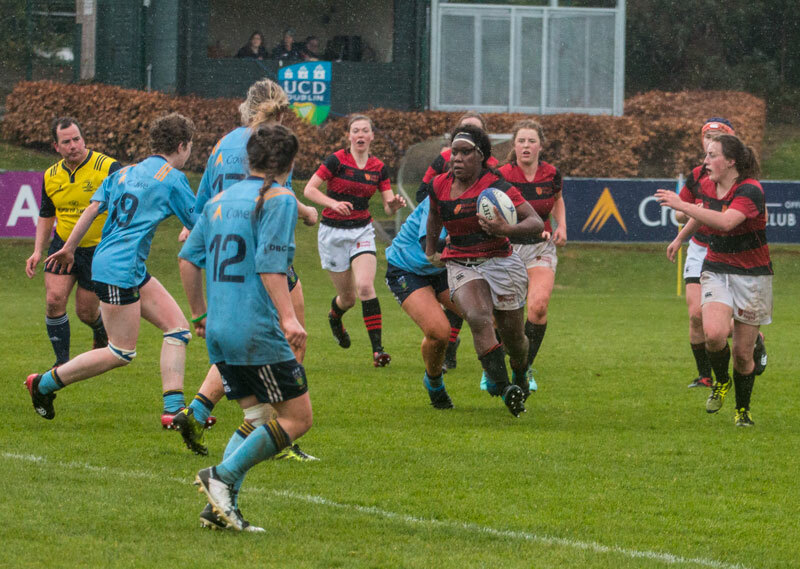 Great carrying from Leahy and Irish international Linda Djougang kept Trinity moving forward, until eventually Ciara Black burst through a gap in the worn-out UCD defence and crashed over the whitewash. MacNamara added the conversion to make it a one-point game. DUFC, it seemed, began to smell blood and the chance of a first Colours win in four years. With the rain bucketing down they threw themselves at the UCD defence. Djougang made yards off every carry and things looked set up for a tasty finish. A second-half fightback from DUFC was not enough to claim a first Colours win in four years. But Trinity were unable to convert this dominance into points and, as the minutes ticked by, momentum imperceptibly swung back towards UCD. A period in the Trinity half led to a Trinity lineout inside their own 22. UCD won the ball back and Tess Meade nearly went over, held up by a Trinity hand. UCD stayed calm, winning possession from the scrum and playing the ball out wide. Ali Coleman spotted a gap and was just about dragged down. Again UCD opted to go wide and it paid dividends, with O’Dowd diving over for her second of the match. Coffey booted over what was a tough coversion to put UCD 15-7 to the good. And this is how the scoreline finished. Trinity kept up the pressure, the pack putting in a heroic shift. Even after the clock had run down and an equaliser was impossible, the visitors kept up the pressure. But UCD managed to keep them out and eventually forced a turnover and kicked the ball out. Delighted, the bench emptied as UCD’s substitutes and management raced across the pitch to celebrate their win.